plant-killer that i am, i probably should have waited until the day after april fool's to begin the urban herb project. i'd been eyeing the weird chia set at duane reade for weeks already, though; for better or for worse, yesterday was it. 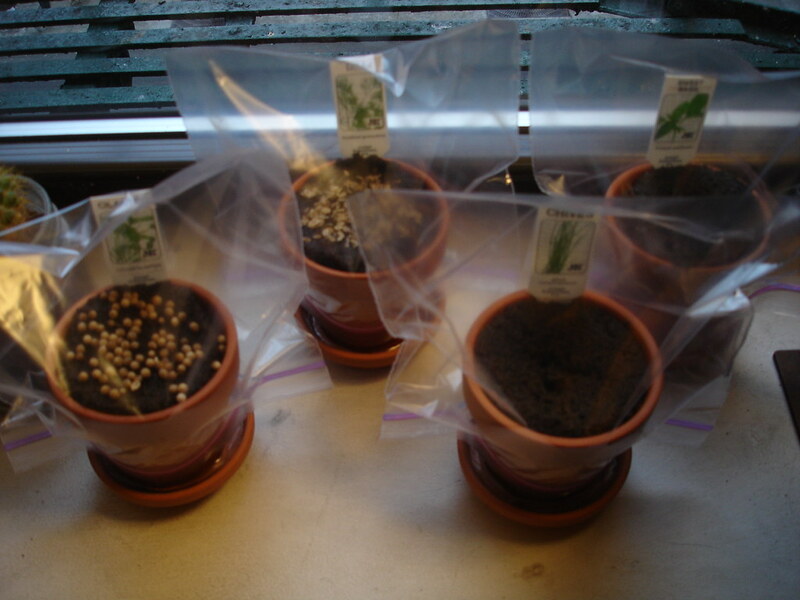 from left to right, i'm attempting cilantro, dill, chives, and sweet basil. here's hoping the cats haven't eaten and yarfed one or all of them by the time i get home tonight. *= the only thing i can stand at mcdo, and a traditional and extremely occasional reward for, say, dropping someone off at the airport at 7am (hey, at least i can make a stranger microwave an egg for me!). i also developed weird cravings for them when we were in belfast last summer, but that's another story. At least with the McMuffin, you can kind of see basic forms of food. The English muffin you recognize. The sausage patty too. The egg does come in a cranberry-sauce-a-la-Bart perfectly cylindrical slice, but you can still make out (a) the white and (b) the yolk. Apart from the slice of American cheese, you can figure out where every piece of the McMuffin came from. well, yes and no, and that's good and bad: i of course don't get the meat (which once caused my dad, in an airport mcdonald's line, to burst out into song: "hold my ham," a deeply questionable hootie & the blowfish adaptation). and the actual sausage, if it's anything like the burger patties, comes from as many as thousands of different animals, from several countries - so you know what species you're working with, and that's about it. it would be sort of comforting to see the egg, in turn, but i make a point of getting cage-free ones at home, and it's widely known that fast food providers do all of the horrible caging and de-beaking stuff to their chickens that turns ovovegetarians into straight-up vegans. i've ignored that for a while, but i think i'm going to stop eating eggs i haven't purchased. in other animal (and pseudopersonal) news, hey, how 'bout dog-killin' judith nathan? could that woman make me hate her any more?